Aluminum Mini Blinds are ideal for apartments, dorms, spare bedrooms, or any window covering need where cost is a major consideration. Made of 6-gauge aluminum, Aluminum mini blinds are scratch resistant and offer a streamlined construction that conceals all mounting brackets. Metal Blinds are extremely durable, plus anti-static paint is applied to prevent dust from collecting on these Mini Blinds. 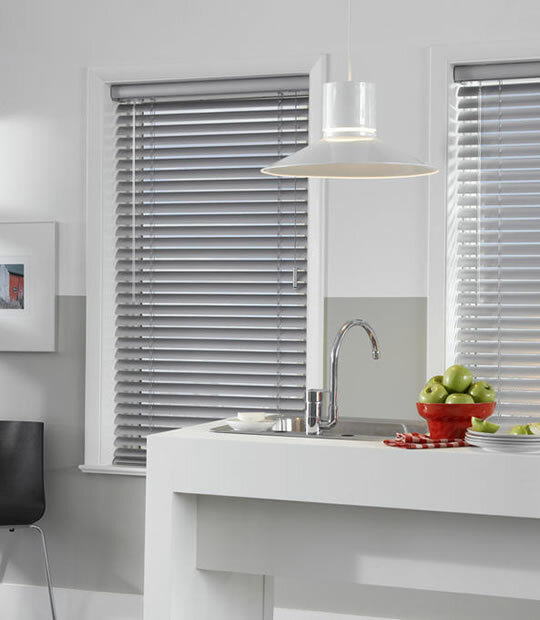 Available in a wide variety of colors, these aluminum mini blinds are sure to provide long lasting performance. Standard 2 slat valance conceals the headrail and gives a more finished look. 6-gauge heat-treated, spring tempered slats to resist bending. Clear plastic wand tilt is a standard feature. Not available in cord tilt. Minimum mounting space required for inside mount 3/4". Flush mounting space required for inside mount 1". Blinds less than 24" must have split controls. Outside mount flat space required 1". Recommended single blind width 72". Clear wand tilter is standard. 1" x 1" Metal headrail. 2 on 1 or 3 on 1 headrail available for wide windows over the maximum recommended single blind width i.e. Sliding glass doors.